Ladies and gentlemen, the eagle has landed. Mission accomplished. One small step for man, one giant leap for my available nap time. 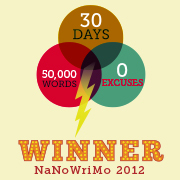 I’m a NaNoWriMo winner! The month sailed by, even though I was writing at least 1667 words every day for my real life job, too, and I enjoyed it immensely, but I’m also pretty glad it’s over. I know for a fact that I wrote a lot of nonsense that will need to be thrown right out the window, and not being able to trim it down in the name of word count has been very tough. But now I can go to town on it and no one will care. Ah, sweet freedom. I’m nowhere close to actually finishing the book, but I am coming to the beginning of the end. Chaos is ensuing and people are getting whacked. The last few thousand words actually flew by because I was causing so much death and destruction, and we all know that’s the fun part. At the beginning of next week, we will return to our regularly scheduled programming, and start off the month of December with a bang. Stay tuned for a really big announcement! How is everyone else doing? Making progress? Falling behind? Making a heroic effort to pull off a miraculous victory? And…. so what’s next? Will you be basking in accomplishment and stewing in the glorious glow of completion, or, will you continue on? Once you’ve mopped up the last few thousand word’s blood bath…where to next? To edit,to ferment, to forget it entirely? My NaNo fling ends tomorrow. I think I can start December off with fresh eyes to rough edit. But I wonder if I will even bother. All this NaNo flurry sort of cheered me on. Without it….well….I’m just not sure. How is everone else anticipating the NaNo let down? I think I’ll soldier on after giving myself a day or two to edit down the worst of it. After all, I’m planning to release this book in the spring, so it’s got to be finished eventually! I know what you mean about the let down, though. It’s just not the same when you’re not being pushed to do it every day. There’s always Camp NaNo, though!